A great chase day and the shortest I’ve ever driven for a chase! The toughest part of this day was figuring out our target. 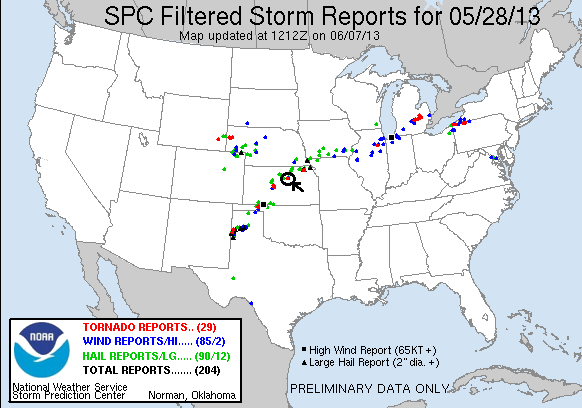 We started the day in Salina, KS sleeping in a little and waking to discover that we had 3 distinct targets to consider: Northeast Kansas just east of where we were along the boundary with a good combination of shear and moisture, a nice high plains setup in Northeast Colorado, or the southwest part of the boundary near Dodge City, KS. We agonized for a bit and told the guests we’d meet an hour later, then decided that at least we would not take the Cheyenne Ridge bait and hedge more about where on the boundary to play, so we waited, then went to lunch, hung out at Walmart, then parked at the Petro on the north side of town and waited some more, as by now we’d decided to play the northeast target. Problem was, it looked like we’d waited too long with a cell already dropping a tornado in the Manhattan, KS area, 100 miles east of us and out of range! We calmed down and reasoned however that if we could get a cell to develop and right turn into the same environment the Manhattan storm developed in, it might do the same thing. We continued to wait as towers bubbled all around us and more and more chasers parked at the same gas station with us, until finally an updraft just to our west took off and we headed out north on old Highway 81 after it. The storm was not moving fast at all, and we were easily able to get east of it, parking just off Rt. 18 west of Bennington. As we watched, the storm, which was really a group of updrafts, began to congeal into one supercell and showed immediate signs of rotation, much as the Manhattan storm had. We kept our fingers crossed as a cell to the south merged with it, and storm survived and was soon a rotating monster! The rotation under the mesocyclone continued to increase until, 35 minutes after we initially parked, a long elephant trunk funnel formed, making it 2/3 of the way to the ground (there were some reports of a brief touchdown but we were not in a position where we could see it) before dissipating a minute or two later with a neat ropeout. By now, the wall cloud was spinning like crazy and it was only a matter of time before it tornadoed, and 15 minutes later the storm dropped a big cone about 3 miles west of us and slowly coming directly at us. We then watched as the huge cone lasted for almost an hour, barely moving at all. As it got closer you could get a good feel for the motion of the tornado, and soon Bennington was sounding their tornado sirens. As the tornado closed on us, it occasionally got wrapped in rain, peaking in and out as the rain curtains wrapped around. Soon the tornado turned into a monster half-mile wide wedge, sort of reminding me of the Quinter tornado of 2008. What a moose! The structure and motion of the storm was incredible, with a striated updraft and inflow bands streaming in from all directions and wrapping around the updraft. As we sat still in our original spot now for the 2nd hour, something I’d never seen before happened: The storm began to retrograde and soon the storm and the tornado were moving west away from us! At this point the whole tornado was rain-wrapped from our vantage point, but the motion of the cloud base and inflow told us it was still in there. Finally it seemed to wind down and the storm went into obvious HP mode, dumping well over 6 inches of water on the same area where the tornado had been grinding away. Worried about the flash flood warning, we finally left the area about 2.5 hours later, having never moved once after we stopped! A fantastic chase day virtually right on top of us! In fact, I measured and from the Petro parking lot to where we watched the storm unfold was only 10.4 miles! Incredible! We headed to Logan’s Roadhouse for a nice steak dinner, then to the hotel in Wichita for a total distance of 130 miles for the day. Several targets to choose from, but ultimately we chose the target close to our hotel in Salina, KS. After sitting at a truck stop near the hotel for several hours while a large tornado was being reported 70 miles east of us near Manhattan, a storm finally kicks off just 10 miles north of the hotel west of Bennington, KS. As we sat just west of town, there was plenty of motion as the base of the storm lowered and we began to get excited about the storm. Wider view of the updraft with distinct lowering at the base. First funnel of the day. This was a big one and seemed sure to touchdown. Never quite made it though, which was a surprise. There were some reports of a touchdown on this one but we couldn't see it from where we were if it did indeed hit the ground. Large inflow band streaming left to right, another even more defined lowering. Looks like it's raining out of two separate precipitation cores to the north of the updraft. A new area of rotation northeast of the previous one becomes the action area. Tornado! 4 miles west of Bennington, KS. Still not fully condensed to the ground. Now it is! Wide shot. Might as well get myself in there as well. 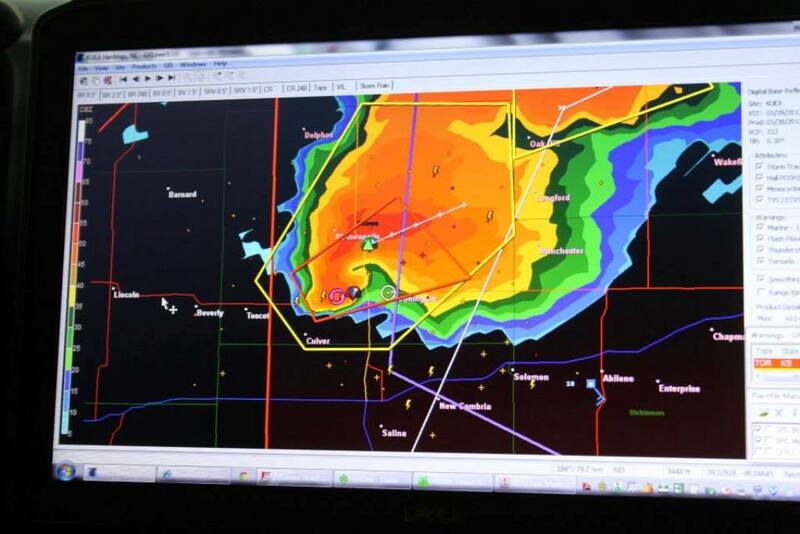 The tornado on radar (we're the white circle). Just about exactly where we'd want to be. Chasing doesn't get any easier than it did that day once we got our storm. Wedging out! This was a BIG tornado. The tornado kept coming in and out of the rain. Wow! The tornado barely moved at all, first slowly coming towards us, then later retrograding. During the entire chase of this storm, we only stopped once, sitting where were were for almost 2 hours. Tornado continues to sit and spin. This tornado at times reminded me of Quinter, 2008. Wider shot of the meso. Wider still. Thank goodness this tornado didn't form over the town, it would have erased it. The tornado was rated EF-4. More traditional stovepipe look as it gets shrouded in rain. There was some question as to whether this streak to the left of the main tornado was a satellite tornado. On closer look, I don't think it was. The entire mesocyclone wrapped up in rain. Is the show over? Nope! The tornado is still in there as the rain curtains clear. Notice that this tornado has barely moved at all throughout all of these shots, spanning almost an hour. But, finally it's starting to move slowly to the north. As the tornado wraps in rain again, a massive inflow band still coming in from the northeast. Big wedge!! Wrapped up in rain. Turning into an HP monster. This storm dropped 8 inches of rain in it's 2 hour lifespan! In fact, when we eventually moved, it was because of the flash flood warning rather than the tornado. Striations on the leading edge of the updraft. The updraft raining out. Show really is over this time. Still a big inflow tail heading into the storm.